Recently my friend wrote a Facebook post that stated she wouldn't put anything on her skin that she couldn't eat. 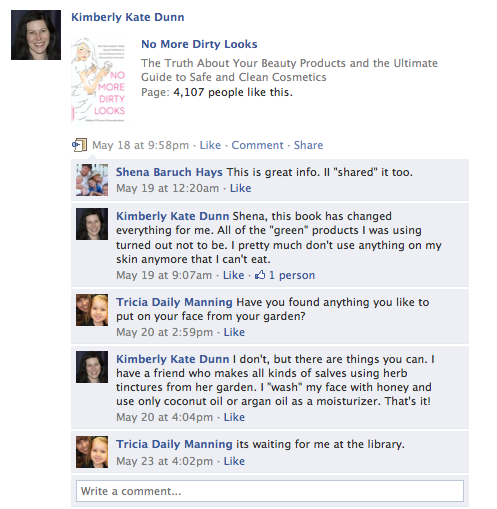 She wrote this after posting info about the book: "No More Dirty Looks". It is an expose on dangerous beauty products and offers alternatives. 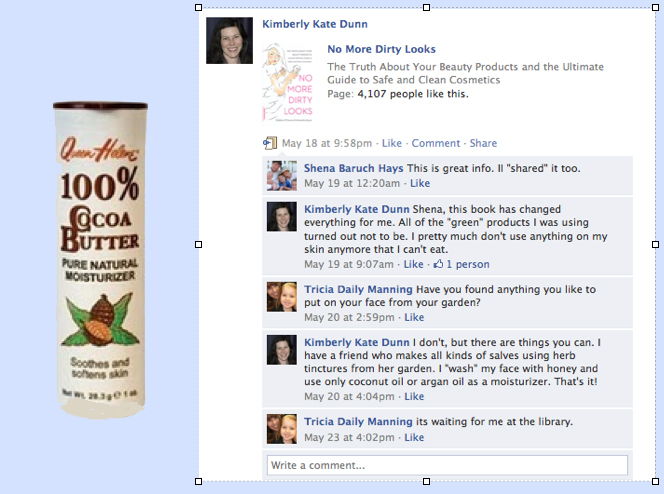 They have a great website with amazing information about "clean" but modern and hip alternative cosmetic products. Today I bought a 100% cocoa butter stick to rub on my face. I chose this "edible" option because a few years ago my sister told me that a girl at her work had the most amazing skin she had ever seen and this girl rubbed cocoa butter on her skin at her desk throughout the day. I have been shamefully neglecting my skin so I thought I would get this magic, organic, $2 stick and take better care of my skin. Now my face smells like chocolate all the time. Maybe it will cure my chocolate cravings too. 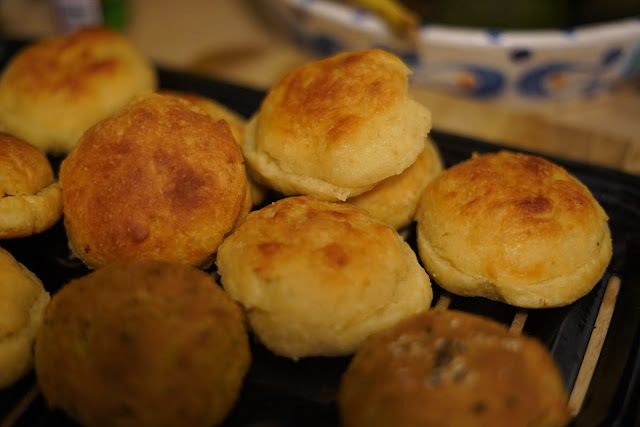 Here is a great blog review of it. I learned about this cocoa butter when I started massage school and I swear by it. Some of the brands that are similarly packaged have different ingredients, but this one is perfect for so many skin needs. I remember Steve waking me up one morning because he found the sleeve all chewed and Rubydog had eaten the whole stick (with no negative effects that we know of). I've also found a great lotion at an aromatherapy course that I'm going to order online. I haven't found quite the same ingredients in the lotions at Wards or Mother Earth or in the stores in Daytona when I visited my mom. I've been "scenting" them myself with essential oils that are known for their skin benefits and my skin has never looked better. I'm going to buy a half gallon soon and I'd be happy to bring you a sample. I keep it in the fridge so it cools my face when I get out of the shower. My only caveat with the stick cocoa butter is that you CANNOT leave it in the car for any amount of time in Florida. Even in winter (unless it is freezing). If you take a chance with this, I suggest a Ziploc baggie. I would love a sample Kathleen! Thanks for the lotion link too.